Welcome to the Piscatoris Fishing Colony, the home of the Monkfish! This little place was overrun by trolls and was not a nice place to stay. 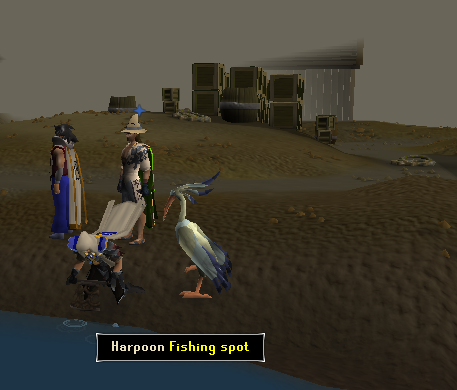 When you've done the Swan Song quest it becomes a peaceful little fishing spot. Because the Fishing Colony is far away from Human Settlement, it can become rather awkward to walk there. 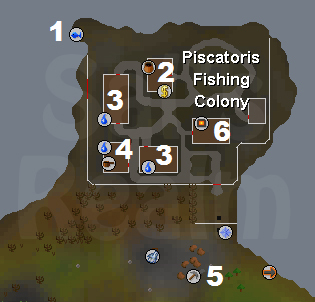 Below is some methods which make getting to the Fishing Colony easier. If you have started Fairy Tale Part 2: Cure a Queen, and obtained permission from The Godfather, you can use the Fairy Rings, which make travelling to the Fishing Colony easier. Head to the main Fairy Ring in Zanaris and use the co-ordinate, AKQ. This will take you to the Piscatoris Hunting Grounds. Head North to get to the Fishing Colony. If you Lasso one of these Eagles, it will take you to Eagle's Peak. Exit Eagle's Peak and climb down the Mountain and you should find yourself near Nickolaus' Tent. From here, keeping going North and you should find the Colony. There's quite a lot of stuff to do here, but the main attractions are the fishing spots. 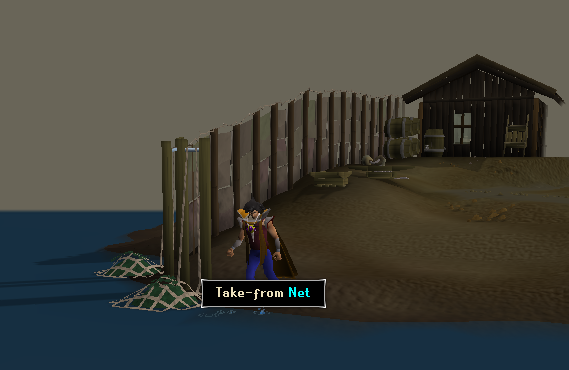 In the northeast corner of the island near the fishing spot is a seaweed respawn, they are much quicker than collecting on Entrana. 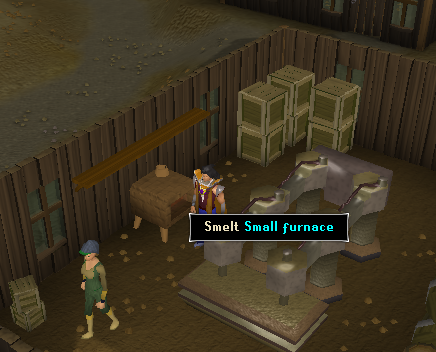 This is run by Arnold Lydspor, he will kindly put items in your bank and will let you browse his General Store. He also sells a variety of different items, items that you wouldn't find in a General Store. 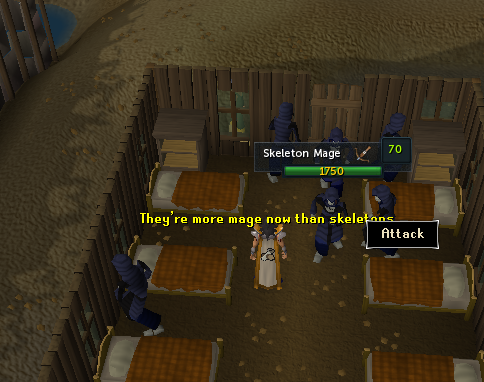 Remember those Skeleton Mage's they helped you fight the troll in the quest? Well they are still here and they say that they are staying here forever. Give 'em a kicking around by killing them. They are Level 83 and use Fire Blast. Bring some armour that's magic resistant such as Dragonhide and start owning them! There's a stove in the kitchen, a little way from the bank. 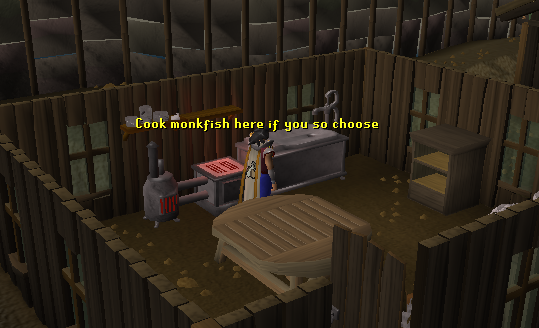 It might not be the closest range to a bank but if your planning on cooking your newly caught Monkfish, it's the closest range to the fishing spot. Outside of the Fishing Colony are some rocks containing Clay, Copper, Tin and Iron. 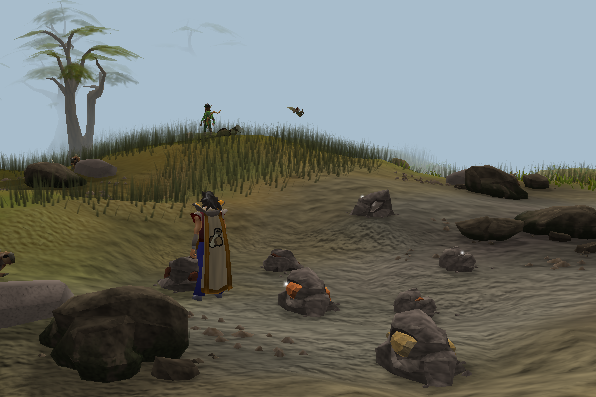 Not the best rocks in the game but the bank and the furnace aren't too far away from each other. Southeast of the Bank is a Work Shed containing a Mini Furnace and a Press. The Furnace will smelt your ordinary Ore but the Press will press your Iron Bars. There's no point making pressed iron sheets because they only sell for 20gp ea. There are several people spread out across the fishing colony, some are fisherman and some are in charge of the fishing colony itself.